If you feel nervous or anxious about dental treatment, you’re not alone. It is estimated that up to 15 percent of Americans experience dental anxiety, and some are so apprehensive about going to the dentist that they avoid it entirely. Dr. Samir Ayoub is a gentle and compassionate dentist who wants you to feel comfortable in his care. He can work with you one-on-one to develop a strategy that allows you to receive the dental care you need without feeling stressed, anxious or fearful. He hopes this blog post serves as an excellent resource to help you start thinking about overcoming dental anxiety. Start by identifying why, exactly, you are afraid of going to the dentist. Do you dislike the lack of control you have? Are you afraid of needles or shots? Do the sounds or smells of the office bother you? Did you have a bad experience with another dentist? Once you have identified the nature of your fear, you can go about confronting it. You can ask for recommendations from friends and family for an excellent, trustworthy dentist like Dr. Ayoub. You can talk to the dentist and staff at the beginning of your appointment and have them explain the instruments they will use during treatment. You can also come up with a hand signal or gesture that indicates you would like to pause treatment at any time, giving you some feeling of control. How do you usually deal with sources of stress in your life? Do you like yoga or meditation? Try practicing your go-to relaxation technique as you anticipate treatment. Even performing some simple controlled breathing techniques can slow your heartbeat and relax you before your dental visit. Another great way to overcome dental anxiety is not to think about it! Bring noise-cancelling headphones and zone out to a podcast or relaxing music during treatment. Watch a movie or your favorite show if your dentist has a television in the treatment room. You can even bring a loved one to your appointment to keep your mind off treatment. 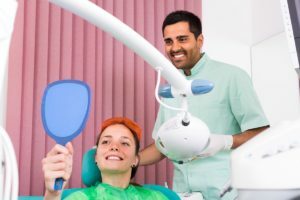 Many dentists, including Dr. Ayoub, offer sedation dentistry, which involves the use of special medication to put you into a deeply relaxed state. The medication can be administered through a small mask placed over the nose, an oral pill or an IV. For more information about sedation dentistry or other strategies to overcome dental anxiety, please call or email San Francisco Aesthetic Dentistry today.